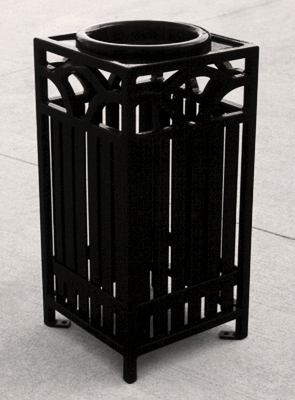 The Summerfield series steel outdoor cigarette waste receptacle with ash urn performs a very important duty of encouraging proper cigarette waste disposal. Choose spun aluminum or powder-coated cigarette ash tray. Convenient mounting holes at the bottom for securing to concrete. Constructed of 1-1/4" solid steel slats with continuous weld seams that penetrate the metal and ensure a weld that is virtually inseparable and rust deterrent. Protected with 7-15 mils of polyurethane super high-gloss powder-coating in your choice of colors shown.